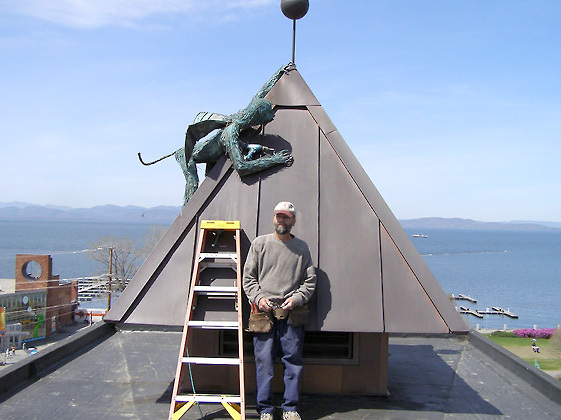 Steve Larrabee was born in 1950 in Mineola, New York, and he died on April 5, 2011 in Jericho, Vermont. He attended Trinity College in Hartford Connecticut on an athletic scholarship, (B.A., 1972), Boston Art Institute, and the Rhode Island School of Design. He was a teacher, builder, woodworker, cabinetmaker, illustrator, lithographer, painter, sculptor, and friend. The first two winged monkeys were made out of steel in the 70's. The third, wings back, in heat, baying at the moon, is copper with a patina, sculpted in the 90's. The twins, in 2005, are also copper, but blackened, as offspring of the original pair. The Rogue Lover, excited, with his eye on the prize, is copper with patina, blue too, what were the odds?